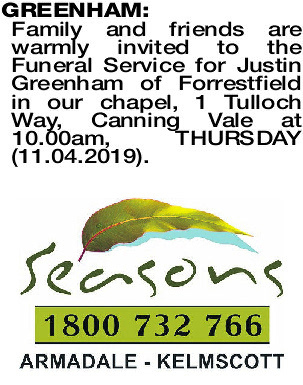 Family and friends are warmly invited to the Funeral Service for Justin Greenham of Forrestfield in our chapel, 1 Tulloch Way, Canning Vale at 10.00am, T HURSDAY (11.04.2019). 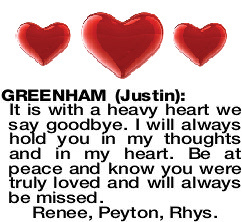 It is with a heavy heart we say goodbye. 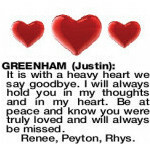 I will always hold you in my thoughts and in my heart. 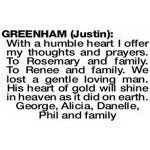 Be at peace and know you were truly loved and will always be missed. 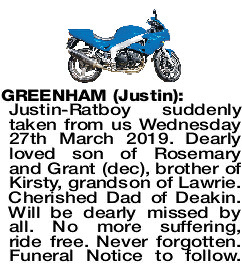 Justin-Ratboy suddenly taken from us Wednesday 27th March 2019. 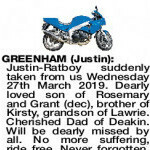 Dearly loved son of Rosemary and Grant (dec), brother of Kirsty, grandson of Lawrie. Cherished Dad of Deakin. Will be dearly missed by all. No more suffering, ride free. Never forgotten. Funeral Notice to follow. 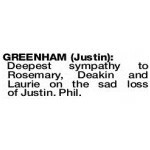 Deepest sympathy to Rosemary, Deakin and Laurie on the sad loss of Justin. Phil. 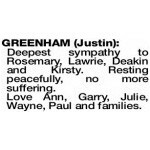 GREENHAM JUSTIN Deepest sympathy to Rosemary, Lawrie, Deakin and Kirsty. Resting peacefully, no more suffering. 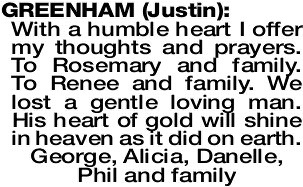 Love Ann, Garry, Julie, Wayne, Paul and families.